National Eat a Red Apple Day is on December 1st, and employee Alex decided to incorporate the theme in to this week’s Recipe of the Week. 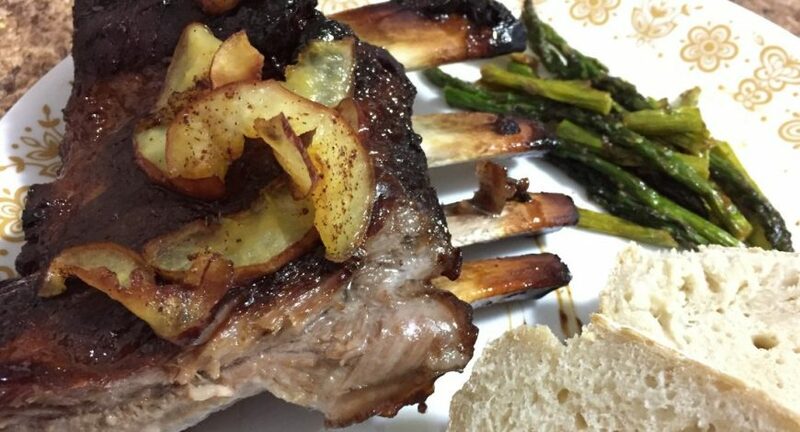 You might be wondering how Sticky Ribs could possibly be a recipe that celebrates red apples. There is only one way to find out – read on to see how she did it, and how the recipe turned out. Hello everyone, Alex here! When I saw that December 1st was National Eat a Red Apple Day, I knew I wanted to try something fun and challenging. As easy as it would have been to cut up an apple and dip it in maple dip, I knew there had to be a more interesting way to utilize apple and maple. I have always been more of a savory than sweets person, so I started my search for something outside of the box. 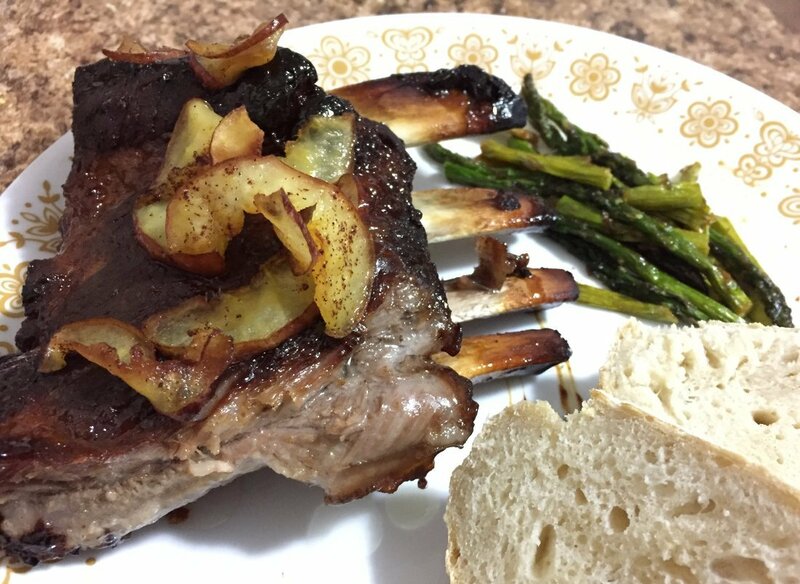 I found my answer in this recipe from Running to the Kitchen: Sticky Maple Apple Ribs with Shoestring Fried Apples. When I was young, I loved apple products so much my mother called me the apple juice kid. 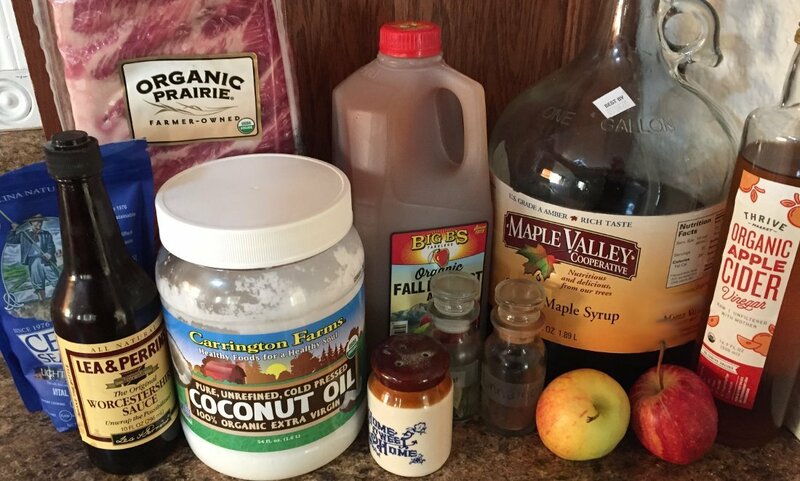 This recipe calls for a large amount of apple cider, as well as ribs and maple syrup – all favorites of mine. I knew right away that there would be some challenges, because I don’t have a deep fryer or a spiralizer to make the shoestring fried apples. I managed to work around the challenges, as you will see below, and the result was a huge success! As usual, first things first. I had most of the ingredients that were needed in my kitchen already and only had to buy apples and apple cider. This recipe also used dijon mustard which I forgot to include in this photo. I appreciate how this recipes was somewhat complex, but still had a limited ingredient list and was easy to prepare for in that way. The first part of this three part process involves preparing the cooking liquid, boiling it, then adding the ribs and cooking for 5 minutes. I had to use ground pepper instead of peppercorns and cinnamon powder instead of cinnamon sticks because of what I had on hand. I ended up needing to fold the ribs in half in order to get them to fit in the pot and be mostly submerged in the liquid. This ended up working just fine as they unfolded easily when the time was up. 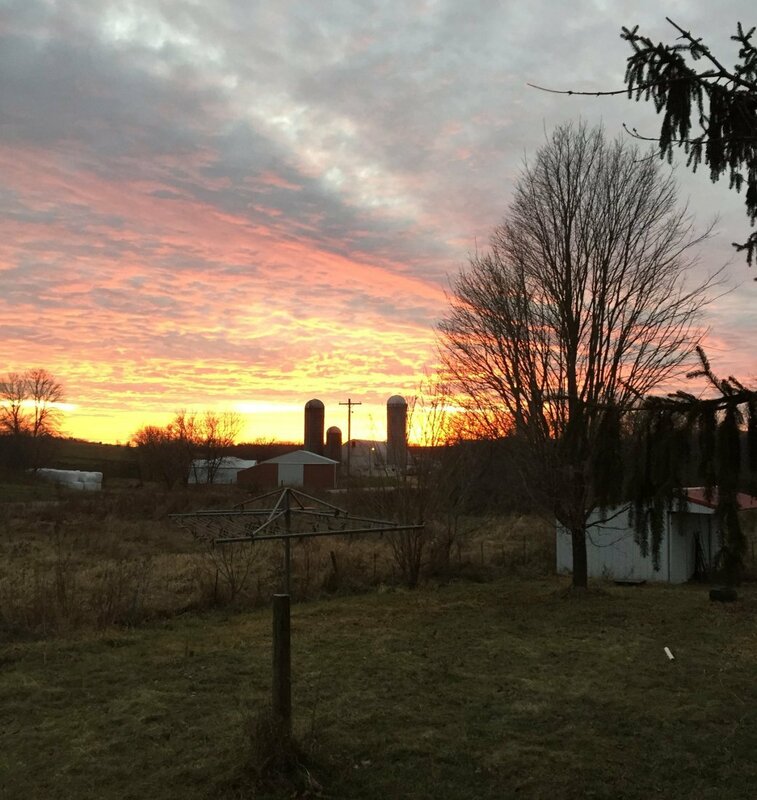 I set the timer for 35 minutes and had a moment to enjoy this beautiful sunset before I got ready for the next part of the process. When the time was up, I pulled the ribs out of the pot and put them in a pan with a little bit of liquid as the recipe instructs. I put a cup of liquid in the glaze mixture. The rest went in to my freezer to be added to some bone broth in the future. This next step was a little bit more work, but worth every minute. I put the ingredients for the glaze into a small sauce pan and set it to medium heat. I stirred it almost constantly in order to avoid burning. It didn’t instruct to do this in the recipe, so I’m not sure if it was necessary or not. After a while it started to bubble a lot and thicken. At the end, it was similar in consistency to barbecue sauce. According to the recipe, I brushed it on both sides of the ribs. I did my best to cover as much as possible. 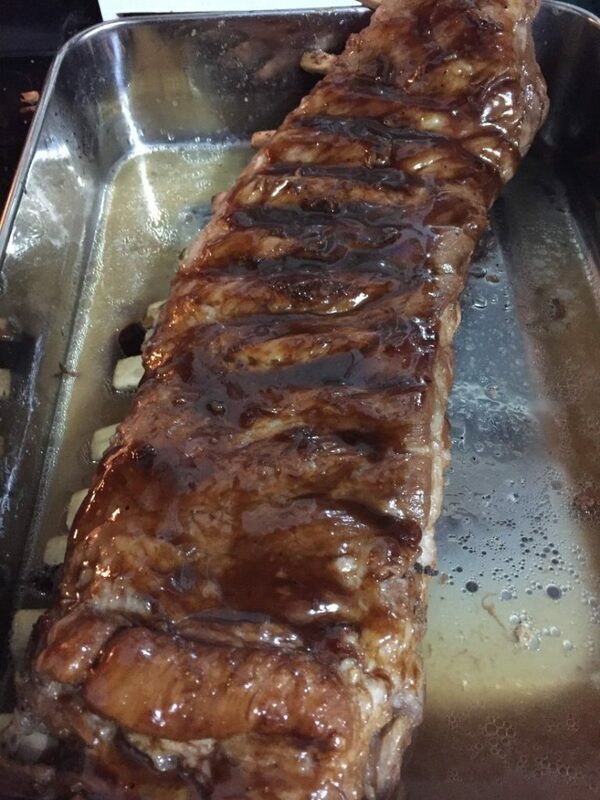 I put the ribs in the oven for 15 min on each side and 2 min on broil as instructed by the recipe. While the ribs were cooking, I began to tackle the last step of the process: fried apples. This part was the most difficult for me. I don’t own a deep fryer and I have never deep fried anything before. I had to improvise with a strainer and pan full of coconut oil. Luckily I had a candy thermometer so I could make sure the oil was at the correct temperature. Since I didn’t have a spiralizer, I decided to thinly slice the apples for frying. 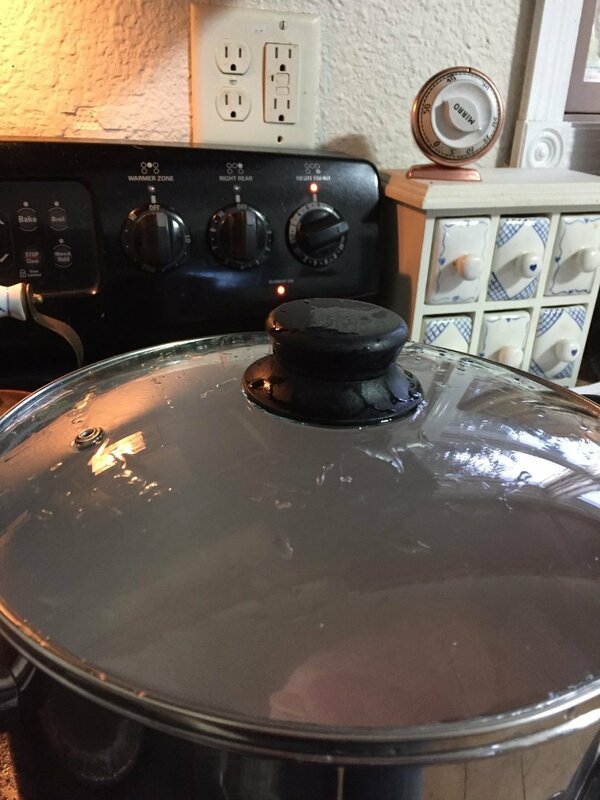 A couple of minutes after adding the oil to the pan and turning on the heat, it started making loud popping sounds as bubbles rose. When this happened, I started to worry that I had made a mistake. My S.O. was ready with a fire extinguisher while I nervously watched the thermometer. Thankfully, the loud popping stopped as the temperature rose and the oil became still. When the temperature reached 375 deg. Fahrenheit, it was ready for the apple slices. I fried them in batches for about 2 minutes each. They did not end up as crispy as I hoped they would, but they still looked good. I garnished them with a sprinkle of cinnamon. When the ribs were ready they looked delicious. They may look burned in the photo, but they weren’t. That dark stuff is just the thickened glaze. I was worried the pan wouldn’t come clean, but it was fine with some soaking. I cut off a few ribs and plated them with the fried apples on top. They were so delicious. They were everything you want in ribs: sticky, sweet, tangy, fall off the bone meat, and not dry at all. The fried apples had a taste and texture that reminded me of apple pie. They were a wonderful compliment to the ribs. Without question I intend to make these again. This is going to be one of those recipes I keep in my back pocket for occasions when I want to wow someone with my cooking. In the future, I think I will skip the fried apples however. I don’t think the payoff was worth the effort on that aspect of this recipe. 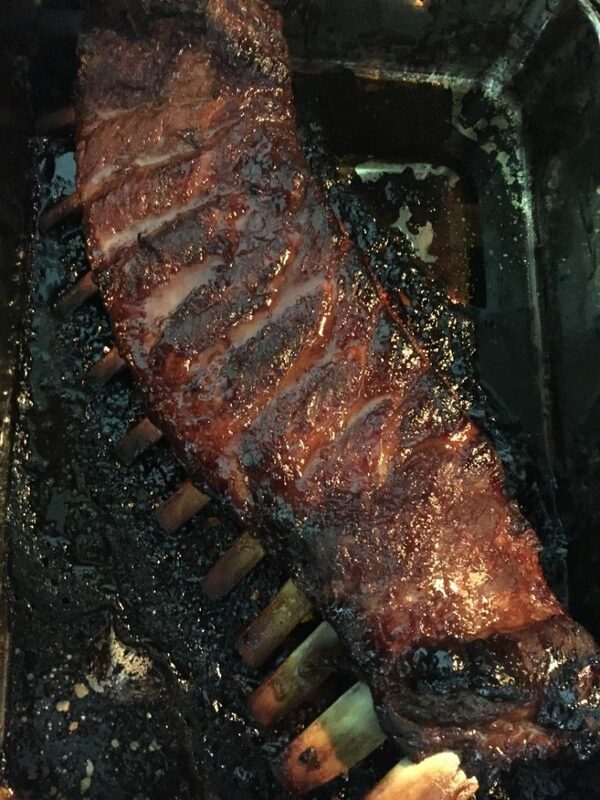 Otherwise – 100% perfect winning ribs. Yum. Did you try this recipe at home? Let us know in the comments how it went and what you changed!